Various powerful people detection methods exist. Surprisingly, most approaches rely on static image features only despite the obvious potential of motion information for people detection. This paper systematically evaluates different features and classifiers in a sliding-window framework. First, our experiments indicate that incorporating motion information improves detection performance significantly. Second, the combination of multiple and complementary feature types can also help improve performance. And third, the choice of the classifier-feature combination and several implementation details are crucial to reach best performance. In contrast to many recent papers experimental results are reported for four different datasets rather than using a single one. Three of them are taken from the literature allowing for direct comparison. The fourth dataset is newly recorded using an onboard camera driving through urban environment. Consequently this dataset is more realistic and more challenging than any currently available dataset. For a description on formats please read the README file in the root folder. In case the data set is used for publications we ask the authors to refer to the above CVPR 2009 publication. Evaluation and comparison of different detectors on this dataset are available on the Caltech Pedestrian website. 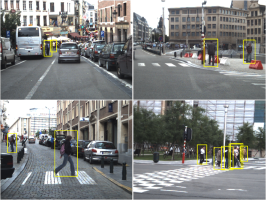 Update 2010/04/13: TUD-Brussels updated to contain the extended CVPR'2010 annotations of Walk et al. Update 2010/04/15: Updated README with some clarifications. For further information and questions please contact Christian Wojek, Stefan Walk or Bernt Schiele.